A fresh and garlicky tomato topping on a crisply toasted baguette slice! I think I’ve mentioned before that I grew up eating a wide range of cuisines, but one of my favourites is Italian. (Actually, I don’t know anyone who doesn’t like Italian food. So yummy!) My mother made a wide variety of Italian dishes, but one of my favourites was the bruschetta that she made. I had a random craving for it this week, so I got the recipe from her, tweaked it a bit, and have already eaten it twice. 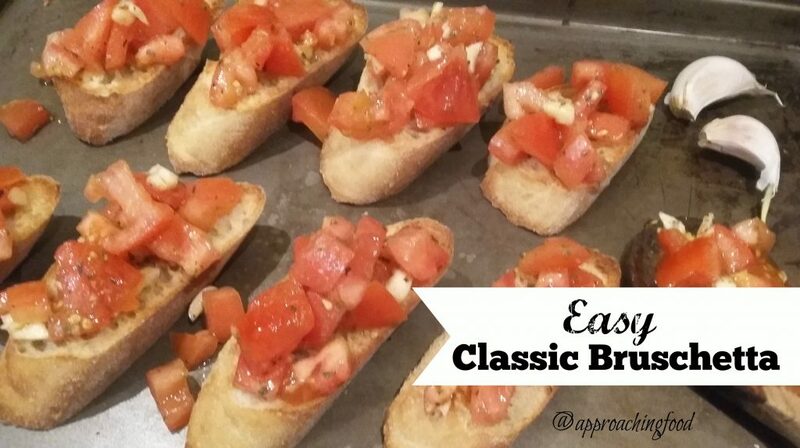 So that’s the recipe I’m sharing with you today: Easy Classic Bruschetta! I’ve eaten bruschetta as a meal, but it’s usually eaten as an appetizer. You really want to use good quality ingredients in this recipe, since each ingredient really plays a starring role. Really nicely ripe tomatoes, some good quality olive oil, and some fresh garlic. And then any old baguette will do. A stale baguette is probably best, but if you don’t have one, just toast the sliced baguette as I do. And as I’ve said before, I don’t usually recommend salting food, but in this dish, don’t skip the salt and pepper. The dish will be flat without it! I don’t bother adding parmesan cheese to bruschetta, the way a lot of people are used to eating it, but you could definitely add some in. Again, a good quality parmesan would be best since this dish is so simple, but if the refrigerated stuff is all you have, eh, you do you, boo! Oh, and one last piece of advice: don’t skimp on the garlic! This is such a nicely fresh, crunchy, and garlicky dish, whether you serve it with a hot pasta dish in the winter, or with a cold pasta dish in the summer, or just as a snack! This simple dish is as classic and as comforting as Italian food gets, but thrown together in minutes. Roughly chop tomatoes and garlic. Toss with remaining ingredients and set aside for 15 minutes to let the flavour mingle. In the meantime, slice a baguette on the diagonal and toast in the oven until lightly brown and slightly crispy. Just before serving, top the toasted baguette slices with the fresh tomato mixture. And chow down! As I said in earlier in this post, I recommend using really good olive oil in this recipe, since it’s such a key ingredient. And as I wrote in the title of this post, I’m a bit of an olive oil snob. Why? Well, I have some relatives in the Middle East and they send me the really pure first press olive oil from time to time and my goodness, is there ever a difference in flavour! I tend to cook with store-bought because why not, but for a dish like bruschetta, a high end olive oil can make a big difference! To be honest though, I’m not really a foodie snob — I just like good food! And this dish is some good eatin’! If you try out the recipe, come back and post in the comments what you thought of it! Next Post: Hmm…perhaps an Easy Yet Decadent Chocolate Trifle flavoured with some almond sherry? With pillowy mountains of cream, and lightly dusted with chocolate shavings? Does that sound good? This entry was posted in Vegetarian Side Dishes on February 11, 2019 by Margaret.